Life in Bollywood is all about ironies. A classic example of the same is that, while on one hand, showing an 'extra-marital affair' was never the in-thing here; on the other hand, it was never even outdated! There have been many films that have been made on the sensitive yet bold topic of extra-marital affair. Examples to this are in the form of classics like ARTH, SILSILA to the recent ones like MURDER, KABHI ALVIDA NAA KEHNA, etc. This week's release HAMARI ADHURI KAHANI also treads on the similar lines (if not the same). Will it give a new dimension to the 'concept' of onscreen 'extra-marital affair' or will it turn out to be a dead affair at the box-office, let's analyze. The film starts off with the old, tired and worn out Vasudha Prasad (Vidya Balan) who is almost on the verge of collapsing on the streets of Bastar district. On the other hand, her old and weak husband Hari (Rajkumar Rao) is pouring his heart out to a doctor emphasizing on the fact that Vasudha did visit him wearing a red dress, something that the doctor rubbishes as his hallucination. Amidst that time, he gets to know that Vasudha has set for heavenly abode. That's when he visits his son's home to do the last rites of his dead wifeâ€¦ only to be shooed away by his son. When everyone is fast asleep, he escapes with Vasudha's ashes to be immersed in Bastar and not in river Ganga. But before leaving the home with the ashes, he leaves a diary for his son (and the audience) to tell the unknown tale of Vasudha. The 20 years flashback shows Hari leaving Vasudha within a year of marriage, but not before making his presence 'felt' in her life. Also to act as an everlasting memory, he gets a tattoo done of his name of Vasudha's arm. In the diary, Hari mentions about Aarav (Emraan Hashmi), the multi millionaire business tycoon and also an owner of a whopping 108 hotels! It was actually a love at first sight for Aarav the very moment he sees Vasudha, who works as a florist in his Mumbai hotel. Aarav gets impressed with her simplicity and selflessness so much that he immediately offers her a dream job in his plush Dubai hotel. After initial reluctance, she picks up the job. Love blossoms between the duo and they find solace in each other's company. Just when everything is going smooth, there re-enters Hari into the life of Vasudha. Hari then explains the reasons and the circumstances as to why he disappeared and why the police have mistaken him as a dreaded terrorist. Vasudha, who initially is mighty upset and angry at the very sight of Hari, then seeks Aarav's help to free Hari from the police by proving his innocence. Despite this being a tough task, Aarav takes it up solely for his selfless love towards Vasudha. While accomplishing the task, a very unexpected calamity strikes Vasudha which completely shatters the lives of Aarav, Vasudha as well as Hari. What is the calamity that strikes the trio, will Vasudha and Aarav ever be able to marry each other and does Hari overcome his selfish ways to help his wife 'unite' with her real love Aaravâ€¦ is what forms the rest of the story. First things first. Despite having a huge 'star presence' in the form of acting power horses like Emraan Hashmi, Vidya Balan and Rajkumar Rao, the film simply fails to register in the minds of the audience. And the main reason for the same is its weak script that is combined with heavy melodrama, which is tough to digest in today's time. It's hard to believe that Mahesh Bhatt who has written this script after a long time is stuck in such a time warp. 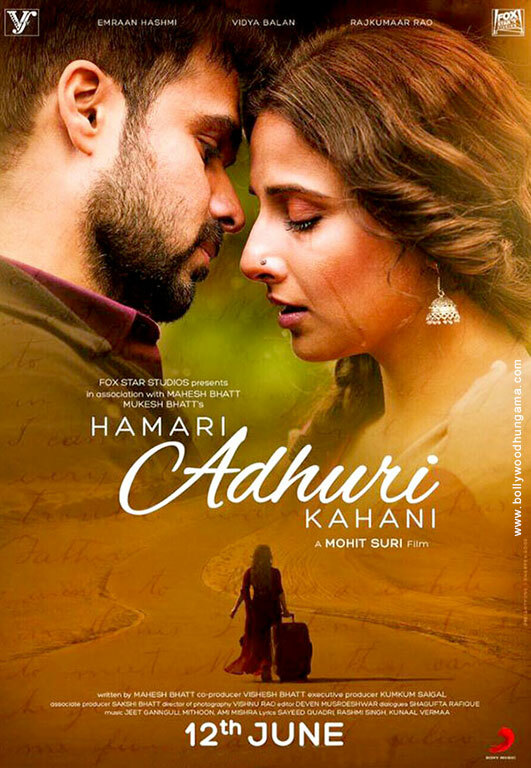 It is indeed even more shocking that HAMARI ADHURI KAHANI comes from the same filmmaker who gave back to back hits like AASHIQUI 2 and EK VILLAIN last. But, in the case of HAMARI ADHURI KAHANI, one can't help but blame its poor script and direction. Despite the fact that the film does have its share of gripping moments, in totality, the film seems to be a letdown. The film's characters are half baked and operate on some bizarre logic which makes you laugh after a point! There is also barely any built up for Emraan and Vidya's love story. Eventually, you just don't feel anything for any of the characters! As far as the performances are concerned, the film (rightly) belongs to the trio of Emraan Hashmi, Vidya Balan and Rajkumar Rao (in that order). While Emraan does put up a strong act as the protective, caring and sensitive lover, it is his eyes that do most of the talking. Vidya Balan, despite being such a talented actress, seems to be wasted in this film. This can be attributed to the poor way in which her character has been written. There are moments which make you feel the pain and the agony that her character is going through, but looking at her character cry helplessly after every few minutes makes you immune to her pain. Rajkumar Rao, on the other hand, has a small role and will be best remembered for his howls and shouts. The rest of the characters help in moving the film forward. Despite the film being made as a soulful one, its soul seems to be sorely missing in its music (Jeet Ganguly, Mithoon, Ami Mishra), the title song notwithstanding. The dialogues done by the Bhatt camp regular Shagufta Rafique are so outdated that it makes you wonder how disconnected they are from the today's time. One has to admit that the film's editing (Devendra Murdeshwar) is not watertight, which could have acted as a saving grace of the film, otherwise. The 'soul' saving grace of the film is in the form of its background music (Raju Singh), which helps to keep you hooked to the proceedings on the screen. The DoP (Vishnu Rao) has done a decent job.